Solutions and Impact Planning are actions that improve upon your existing operations, and or remove obstacles that are hindering profitability, safety, and or the consumer experience. SVS Parking Company provides solutions from parking structure reorganization, Park-Assist programs, impact planning, city permit processing and CUP assistance, to acquisition & development opportunities, lot optimization, and the increase of parking density. Employee Parking – Solution – SVS Park-Assist, and corporate solutions will take care of increase parking density and efficiency plans, or assisting in ascertaining the replacement lot, as well as around-the-clock transportation to assure efficiency and staff moral remains high. The unseen cost of impacted employee performance due to unmanageable parking conditions is something to seriously consider. Why Park-Assist? Corporate campuses have limitation to their footprint prior to considering vertical development for new parking structures; or funding does not meet the requirement to complete a permanent parking facility. During or prior to considering breaking grounds on a new 3-5MM parking garage investment Park-Assist programs can increase your campus parking density between 50-500 vehicles (50-700 employees) at any given time. 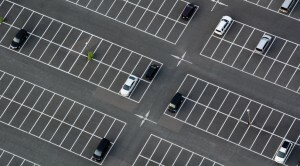 Don’t allow your corporate growth to be stifled by limited parking. Why? SVS Parking Company values neighboring service providers (other companies) and the business they have built to support your business. Our goal is to earn clientele business through our operations and purpose in business, BUT the key importance is 1. sustaining your guest impression, 2. providing consistency in systems, and 3. being an asset to your business not just a service. Consulting you in giving another provider the opportunity to make permanent changes we feel is purposeful in respecting the efforts of other businesses, and helping you gain what you should have (items 1-3). Looking for New Opportunity: In the past year alone SVS uncovered $2MM in lot optimization opportunities for clients. How many spaces can be added to the lot map above? What percentage of space is underutilized? What are the targeted parking demands surrounding your lot and how do you “bring the business to your lot”? Answer these accurately and you won’t need SVS. The simple answers are – lot owners own or lease a lot to support parking for their establishment; not to make money off the real estate value of the lot alone. SVS Parking Company does. Profitability is a result of a successful valet and parking program that proves your investment into SVS Parking Company reaps new growth in returning guests, business revenue, and venue reflection on your consumer market. Profit sharing, and seasonal valet & parking investment analysis are also provided with the SVS profitability program. Optimization should be your first consideration – it is ours. An SVS Parking Company Optimization Plan regularly assesses your investment, assuring your ROI is always maturing. SVS’s quantified PSF basis (profit per square foot) guarantees that related costs support the resulting profit, and margin for increased profit is regularly assessed to assure optimal performance. SVS Parking Company provides twenty four hour facilitation, and facility quality control for municipalities, private owners, corporate groups, and co-ops alike. Profit Centers are “profitability vehicles”; like any performing investment vehicle found in a strong portfolio. SVS Parking Company stands as the profit manager, accountability officers, guest services attendants, and ongoing facilitation consultants. Operations, efficiency, related guests services, and sustainability support the foundation of a profit center. The Parking Facility on your grounds was designed for more than the safe keeping of guests, patients, or clientele vehicles. Your parking structure calls for more than parking management; it should entail a strong element of an investment managing minded team. You have a massive ATM machine that is “open for business” twenty four hours a day, and in profitable use seventeen hours a day.